An epic week deserves an epic blog post. 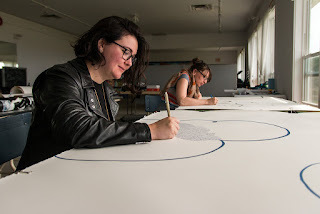 Fiona Chinkan, my best friend and art buddy since 2003, and I went to Inverness, Nova Scotia for a collaborative artist residency at the Inverness County Centre for the Arts. For more detailed information about the project itself, check out our site. We have been working on and off on the Shared Energies project for about 3 years now, mailing drawings back and forth between NYC and Dartmouth, NS. The goal for the residency was to come together and actually collaborate on giant 6ft drawings together. So think of this post as a bit of a mix of journal entry about the residency and also process imagery, but of course some goofing around as well. At the end of each day, Fiona published a video montage of our day on snapchat, so I added each of those videos to the end of each day. Enjoy! The plan was for Fiona to fly in on Friday May 27th, and arrive at midnight. In our experience Fiona has serious bad luck with flights to Nova Scotia. Unfortunately, this bad luck continued through to this trip as her flight was delayed by 11 hours. Pretty incredible that such a thing is possible, but it is. She finally arrived on the 28th, in the late morning. I had already packed the car and gotten everything ready so that we could head up to Inverness straight from the airport. Unofficially and around friends we are known as MaFiA (combo of our names). Due to the travel delay, when we finally arrived in Inverness and got somewhat settled in we had to spend the rest of the evening until about midnight installing the travelling exhibition for the NS Printmakers. Despite wanting to just rest and set up our residency studio space we hunkered down and just got it done. Initially our goal had been to go for a walk on the beach every day, little did we know that this was going to be the only walk on the beach we managed, the rest of our adventure was just too full of so many things going on. Next time though it will be planned in... again...! From two until five pm we attended the opening reception of the the NS Printmakers travelling exhibition. For photos of that inspiring event, please visit here. Before and after we arranged the studio space at the I.C.C.A. to suit our needs. What a fantastic space! Basically endless amounts of tables available, a stunning view of the ocean and a grassy yard. It was nice to see our residency posters up at the entrance door every time we entered. Our SUPER fast set up. Sunday in Video - Summary. Fiona and I both brought all of the collaborative drawings we had done to date as well as each of our own individual drawings. Laying them out on the table and finding parallels and dialogues between various bodies of work was a really exciting activity that stretched over the whole day. Anytime one of us needed a break from drawing we played around with various arrangements, mixing and matching the work. Our daily schedule at the art centre was to arrive between 9 and 9:30 am and head back to our accommodations at Elizabeth Whalley's lovely house around midnight. We would leave usually for either lunch or more commonly dinner, and then return for the late shift. So on the days where we were occupied with other activities during the day we often still got somewhere between 6-8 hours of drawing in. Hours and hours and hours of small detail drawing. There was much tea. Decaf Tetleys with cream for Fiona and dragon pearl jasmin with fresh squeezed lemon and honey for me. Made great progress on this piece and hung it up on the wall to think about the next step for a while. During our stay in Inverness we saw some absolutely stunning ocean sunsets. As Inverness is on the western side of Cape Breton, it overlooks the Northumberland Straight, the Gulf of St. Lawrence and really the Atlantic Ocean as it pushes around Cape Breton Island. I would get so excited about the sunset that I ran outside to frolic in the yard of the arts centre. Completely forgetting that it had poured all day. And the field wasn't just wet it had water standing. Ahh my shoes are soaked with cold water!! There is a skylight, outside the entrance. Time-laps video of us installing the small collaboration drawings. Tape, Measuring tape, nails and magnets... go! We spent the rest of the evening installing our own exhibition in the hallway gallery space leading to the studio. The first installment of "Shared Energies - Cells, Stars and the Fluidity Between". This is an ever growing, shifting and changing body of work. It will be up at the I.C.C.A in its most recent incarnation until June 27th. Monday in Video - Summary. After a long day of drawing we taught an evening workshop. Artistic Collaborations 101 was the first workshop we taught together, and it was a lot of fun. We had 4 keen students and some pretty cool things happening. As one of the most important rules of collaboration is for all parties to consent we don't have many photos to show of the creations and experiments that were made. Fiona and I had brought in a ton of our own art supplies and the participants had much to experiment with. This was a fast half an hour collaboration between Ann Schroeder, Fiona and I. It was so great for Ann to bring in scraps of hand died fabric to work with. 4 long days of installing artwork, drawing 6-8h stretches at a time and both of our hands were very sore every morning. Hand massages were necessary. There is a tip for future residencies. The best investment would be an on-staff massage therapist. We were so excited to see the sun that we needed to do some frolicking and goofing about in the yard again. These two photos are animated GIFs. Click on them if they aren't moving.. Yes I know, we are silly. Today was another workshop day. We had 4 very eager participants in our Sketchbook Collaboration workshop. After showing the students some images of collaborative sketchbook approaches we put them through a pretty rigorous half hour of exercises to break down the boundaries from artist to artist. Though nervous and hesitant at first everyone had a great time, and the end results were a lot of fun as well! My dear friend Lisa stopped by to visit after the workshop and lured us out of the studio for a much needed dinner break at the Red Shoe Pub in Mabou. On our way back to Inverness we discovered our faces in the Inverness Oran newspaper and promptly had everyone stare at us for the rest of the week. "Those are those artists visiting at the I.C.C.A." ;) Thank you to the Inverness Oran for kindly telling Cape Breton Island that we were in town! The lovely ladies working at the I.C.C.A. made a flyer announcing our open studio event on Friday. It's on bright yellow paper so no one could miss it. Starting a collaboration at the same time. It doesn't get more fun than this! After such hard work for days and days I was craving the outdoors, so we went for a nice drive up along the Cabot Trail. We stopped at the Frog Pond Cafe, had a decaf coffee and gluten free cookie for Fiona and a soy chailatte with a dairy free energy ball for me. Chuck the dog came to hang out with us. Unfortunately due to traffic along the way we didn't make it far into the Cape Breton Highlands National Park before it was time to turn around. Back in the studio we of course burned the midnight oil again. In the last two days we started and made major progress on three other drawings. Ultimately we each took a few back home to continue working on after the residency. Finishing off the day as Queen of the I.C.C.A. Our supply table took a bit of a hit during this week. It definitely looks like we used it well. Now to clean up. SUPER fast studio clean up! Here a few glimpses and details of our 6ft work in progress pieces. Upon arrival we installed these drawings here and took them down on the last day to put up "Breathing Pulsars" instead. Thank you to the Inverness County Centre for the Arts for hosting us for this fantastic experience. Thank you to Elizabeth Whalley for welcoming us into her home and being wonderfully supportive throughout the entire experience. Thank you to the Inverness Oran for the interview and the centrefold article about our project. Thank you to all the wonderful people who came into the arts centre to visit, talk, respond, criticize and experience our work. A special thank you to Norma Cook Everist, who came by for a surprise visit and completely blew our minds with her energy and complete understanding of our process. Thank you to all of our friends and family who have encouraged and followed our progress and updates online throughout the week. You guys helped sustain us when we got especially tired! Thank you to Fiona, for listening to me cough and be miserable during the entire trip. We were pretty good at hiding it in the videos, but really she put up with me for a week. And we managed to have a ton of fun! Unless otherwise specified all images, videos and photographs in this post are property of Maria Doering and Fiona Chinkan. Please ask for permission if you would like to use them and reproduce them digitally or otherwise. Thank you, Maria, for sharing your experiences. Having you and Fiona as our first artists-in-residence was a privilege and a mind-expanding delight.